DXL (Domino XML) Converter tool is an effective and efficient solution that helps to migrate messages from DXL file to PDF format. The product supports to migrate unlimited .dxl file emails of Lotus Notes without any risk. Also, it creates UNICODE PST and saves all DXL messages to different or the same folder. Besides this, it generates the instant preview of each .dxl email with associated properties. 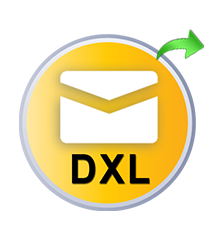 Demo Version of DXL Converter software exports only 25 DXL messages into Outlook PST format. When saving the DXL files from Lotus Notes, users can check or uncheck the desired .dxl messages. The software can convert only selective DXL messages and create an Outlook PST file for it. Also, it can possible to export the entire folder having multiple DXL files at once. This software allows the users to save exported PST file at any specific location as per their choice. DXL Converter tool provides a switch screen view mode feature that makes it so user-friendly. With the help of this option, the users can change the screen to display mode from horizontal to vertical or from vertical to horizontal as per their need. By default, the normal view screen remains horizontal. 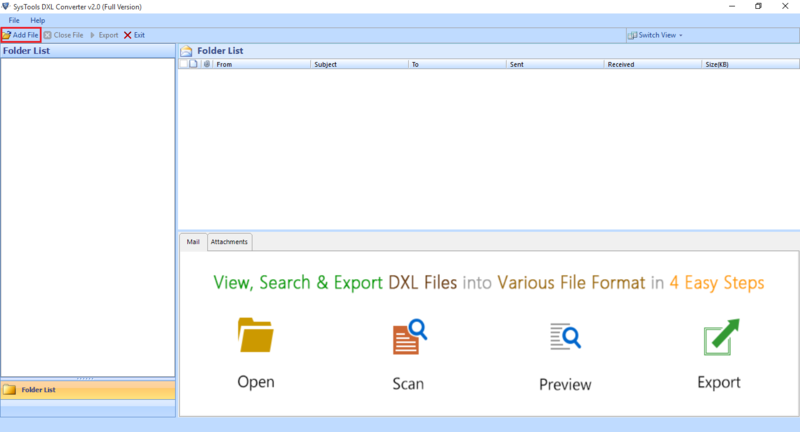 The DXL exporter tool generates the preview of each message from Domino XML along with associated properties i.e., from, subject, to, received date, sent date, and file size in KB. 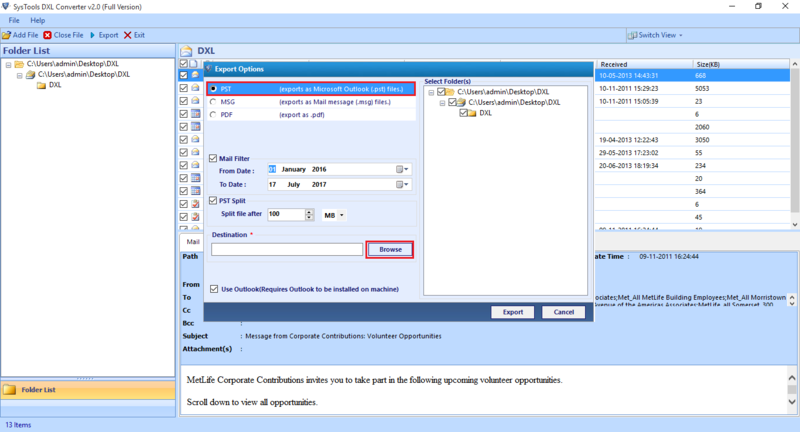 Also, users can view DXL emails along with attachments and folder hierarchy will be retained even after file conversion. Does this converter tool impose any size limitation on output PST file? No, there is no file size limitation on PST file that the software creates. So, users can easily move unlimited DXL files without any size limit. Is it mandatory to have an installation of MS Outlook while converting DXL to PST file? Yes, Of Course, the software requires MS Outlook installation to export .dxl messages into .pst format. Yes, our software provides an option by which users can export only selected .dxl messages and also create the PST file for it. Will this migrator tool retain the folder structure during data conversion? Yes, this application helps to maintain the folder hierarchy and meta properties even after migration. 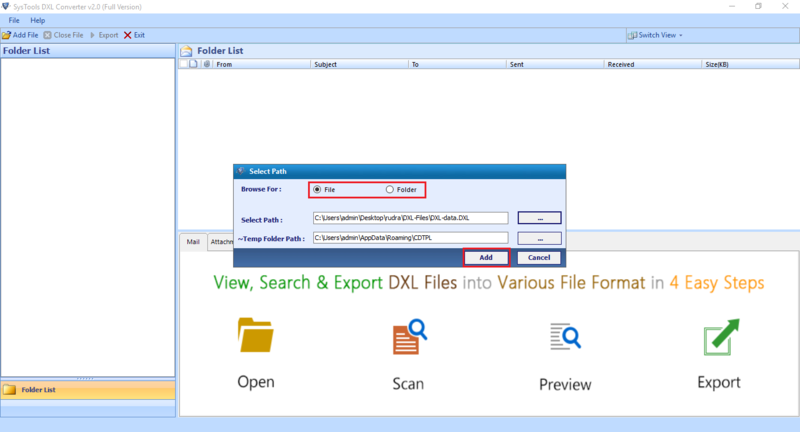 "DXL Conversion tool saves a lot of time when converting multiple DXL files into Outlook PST format. I must say it is one of a powerful product that can export an unlimited number of .dxl file messages at once and creates PST without any file size issue. I want to appreciate the hard work of all developers who had created this amazing software. Incredible Tool!!" "DXL Converter software is a trouble-free solution that I have ever tried. It is an outstanding technique by which I can export Lotus Notes DXL emails into PDF format in a simplified manner. It has a simple and user-friendly interface that even a novice user can use it. Also, it brings out several notable features that help to perform the conversion process. Great effort was done by the development team. Thank you so much!!"